The first practical invisibility cloak is here #WearableWednesday « Adafruit Industries – Makers, hackers, artists, designers and engineers! At long last, a practical invisibility cloak is here. But the Rochester Cloak is not some futuristic, sci-fi belt, or a wizard’s cape: it’s just a clever configuration of standard lenses that bend light around an object, hiding that object in plain sight. That could not only the Rochester Cloak cheaper and easier to make than any other cloaking technology to date, but means we could see it in the real world soon. 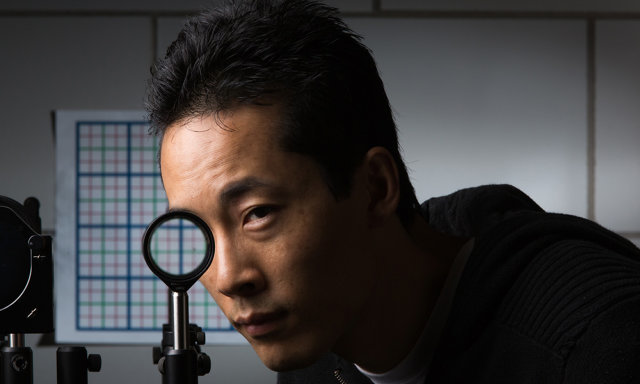 Developed as a co-venture between the University of Rochester’s Physics and Advanced Optics departments, the Rochester Cloak is a surprisingly low-tech response to what is traditionally considered a high-tech problem: making objects invisible. The project is lead by physics professor John Howell, who became interested in the possibilities of creating simple cloaking devices using off-the-shelf materials as a project to do on vacation with his 14-year-old son. Although the fundamental principles of cloaking are always the same–namely, to bend light around an object–many approaches depend on complicated gadgetry or other exotic materials to make something disappear. Even then, the cloaking device only works when you’re looking at it head on: move your head just an inch to the left, and the ‘cloaked’ object pops back into view. Not so with the Rochester Cloak. “This is the first device that we know of that can do three-dimensional, continuously multidirectional cloaking, which works for transmitting rays in the visible spectrum,” graduate student Joseph Choi, a PhD student at Rochester’s Institute of Optics, says on the University of Rochester website. All you need is an array of four off-the-shelf lenses (and some brain power) to make the Rochester Cloak abracadabra something away.